Some vegetables are more satisfying than others when it comes to harvest. Parsnips are in that category, as we discovered the other day (just three days before it snowed! ), when we harvested a crop that’s been quietly growing in the Regenstein Fruit & Vegetable Garden since April. 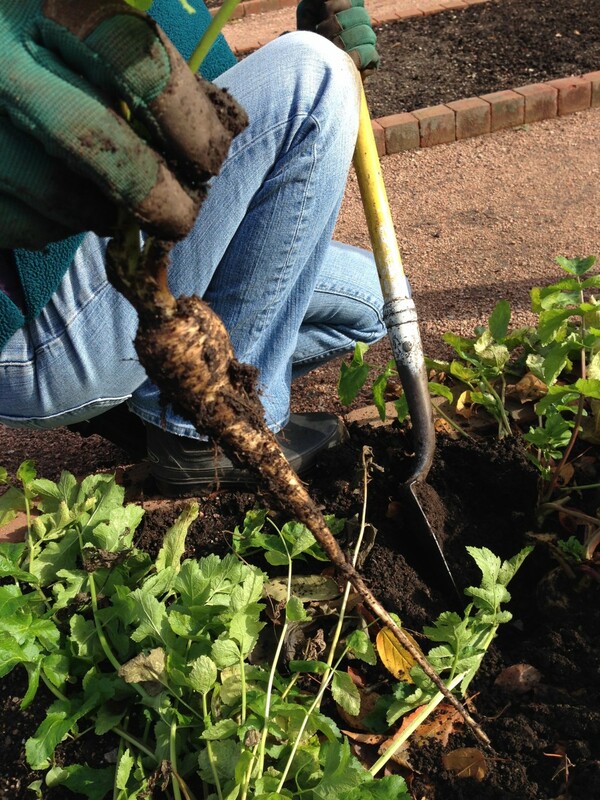 Parsnips have long tap roots that need to be dug gently from the soil. The sun was out, the air was crisp, and the nights were frosty: parsnip weather. Cold weather is actually a good thing for parsnips—in fact, they need it to convert the starch in their roots to sugar, transforming them from lowly, nose-turned-up roots to gourmet, thumbs-up side dishes. We used a pitchfork to loosen the dirt deeply around each parsnip top—a gentle harvest is required, as parsnips are brittle and can snap if eager hands try to pull the roots by their leaves. Aren’t they gorgeous? We planted ‘Albion’ this year, a variety that’s creamy white and elegantly long and tapered. Inspired, we’re adding two other varieties to our seed list for next year: ‘Lancer’ and ‘Half-long Guernsey’. Plant fresh seed. Parsnip seed viability is short, so plant only newly-purchased seed every year. Thin ruthlessly. We thinned four times to guarantee them the wide spacing they need. Mark the rows. A few radish seeds (which germinate in a few days) marked the ends of each parsnip row—which took their sweet time to germinate, in about three weeks. So satisfying: Some of last week’s parsnip harvest. Once germinated, parsnips are low-maintenance veggies in the garden—as befits a vegetable that takes 120 days, plus a cold spell, to reach maturity. 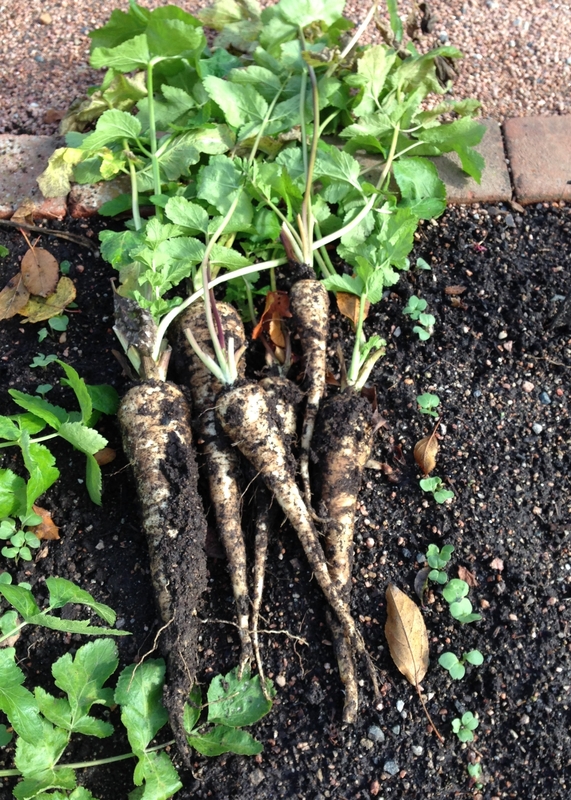 A gardener’s patience with parsnips really pays off in the kitchen. How can you serve parsnips? A bowl of parsnip soup. In a roasted root vegetable side dish. As a snack of parsnip “fries,” brushed with coconut oil, sprinkled with salt, and baked in the oven. As a secret ingredient in mashed potatoes. Boil parsnips in salted water for 3 minutes. Grate with a medium fine blade, then add one egg, white onion, flour, salt, pepper, and lots of Italian parsley. Form pancakes about ½-inch thick and 3 inches wide, and fry in oil on medium heat until parsnips are cooked through and cakes are golden brown and caramelized. Yummy with a roast chicken!